We drove to the right location according to the map, but there was no dome. 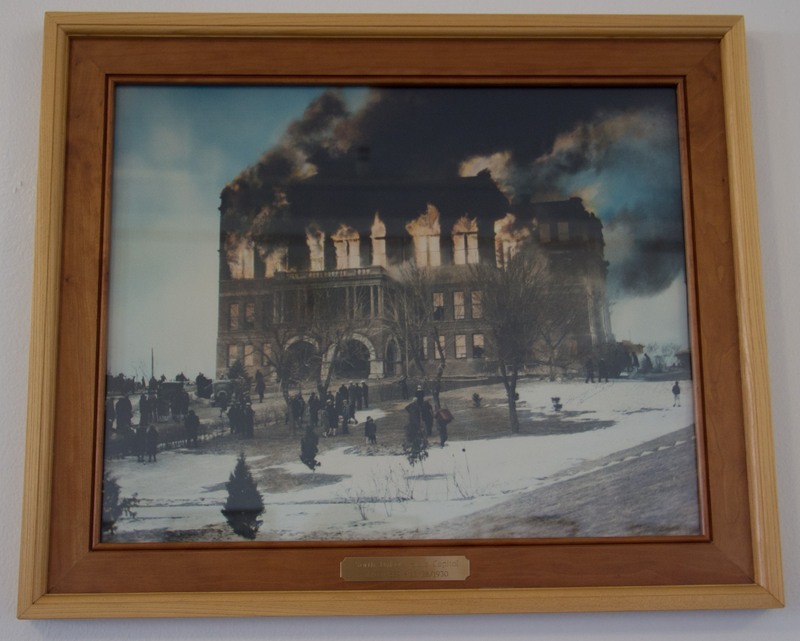 Was this really the North Dakota capitol building? A sign confirmed it was. 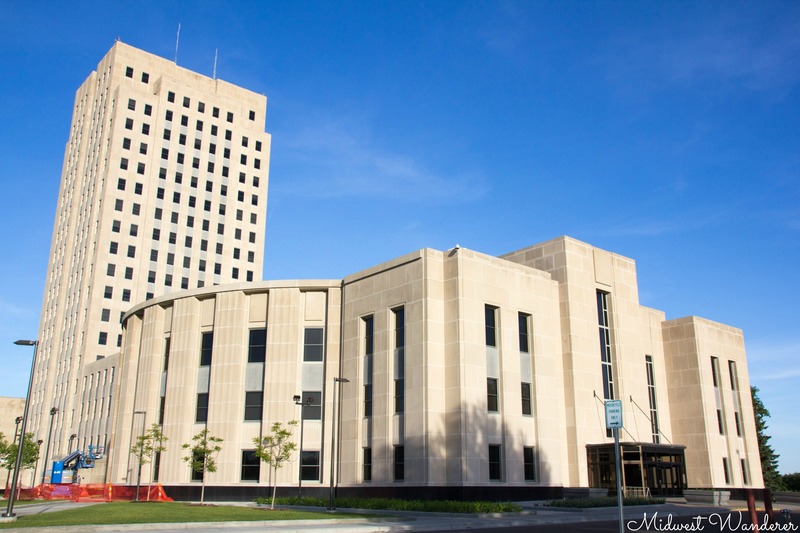 North Dakota’s capitol is a skyscraper design rather than a dome. 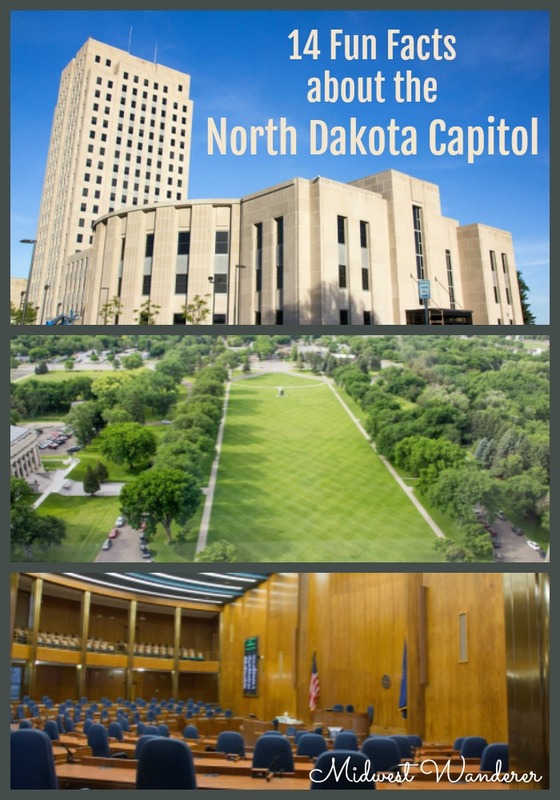 We found out the reason for the skyscraper design and lots of other fun facts on the North Dakota Capitol tour. 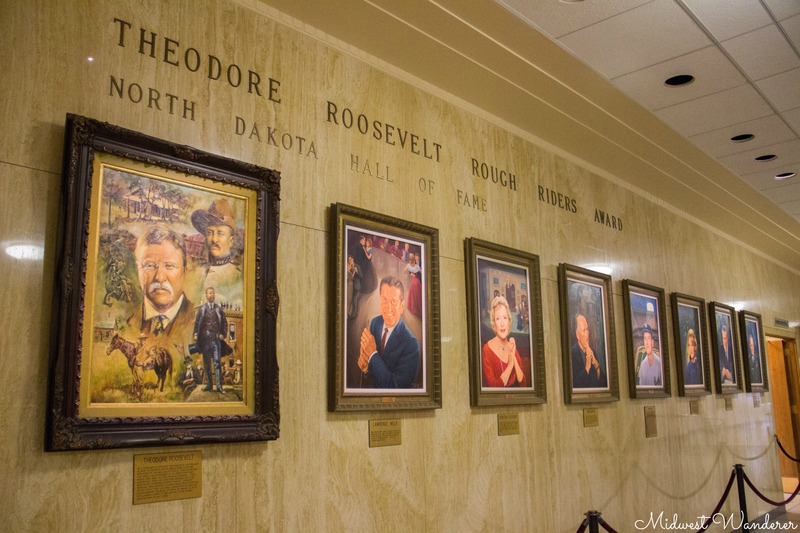 The Rough Rider Hall of Fame, located on the capitol’s ground floor, includes 42 members. The Hall of Fame recognizes people who attained accomplishments that brought honor to North Dakota. Anyone can nominate a person to the Hall of Fame. However, the governor, lieutenant governor, and the president of the historical society determine who is honored. Hall of Fame recipients must have been born in or lived in North Dakota. Some of the Hall of Fame portraits I recognized are Lawrence Welk, Phil Jackson, Roger Maris, Louis L’Amour, and Peggy Lee. 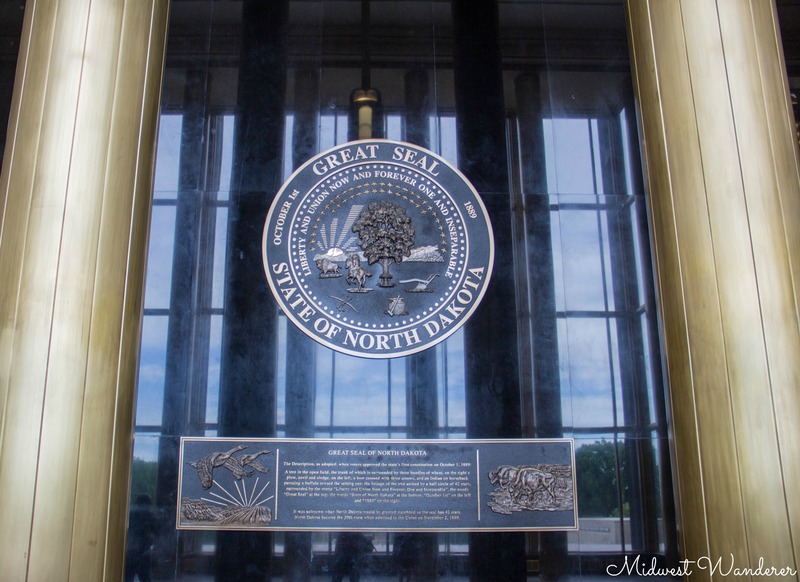 The Great Seal of the State of North Dakota, located in Memorial Hall on the first floor, weighs 400 pounds. The plaque beneath it weighs 500 pounds. The date North Dakota became a state is October 1, 1889, according to the official state seal. However, North Dakota didn’t become a state until November 2. Also, North Dakota was the 39th state admitted to the Union, but the seal has 42 stars. These discrepancies occurred because the seal was designed before North Dakota actually became a state, and they kept the original design. The North Dakota capitol was designed by Edgar Miller. He used a prairie theme and Art Deco style throughout the building. 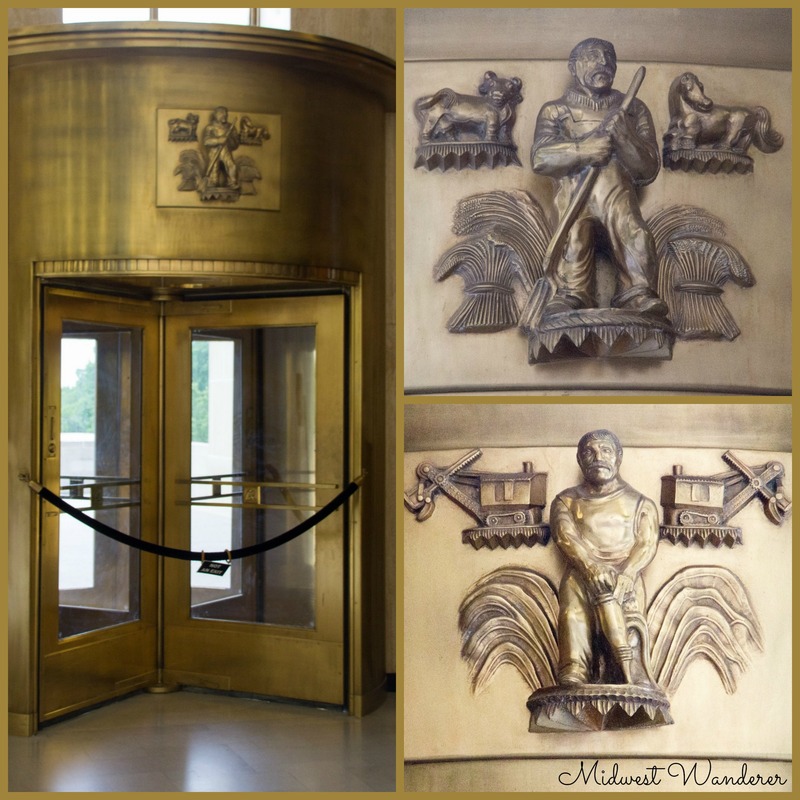 In keeping with the theme, sculptures above the revolving doors in Memorial Hall are that of a farmer and a miner. These doors are no longer used due to security issues. The capitol is a skyscraper rather than a domed building because a skyscraper has 80 percent usable space. A domed building has only 40 percent usable space, at most. Only three other state capitols are skyscrapers: Florida, Louisiana, and Nebraska. 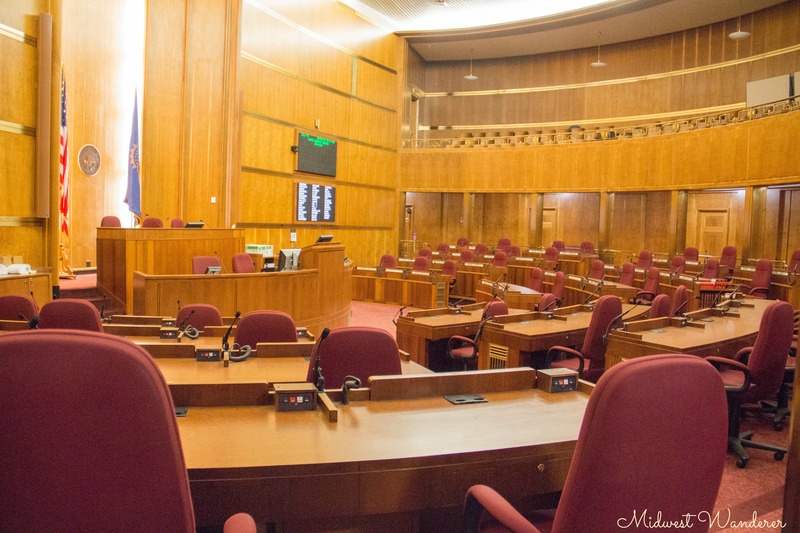 Instead, legislators work at the desks in the House and Senate chambers. Legislators meet every other year on the odd year and meet for only 80 days. There are no term limits. Legislators serve four-year terms, and about half are up for election every two years. 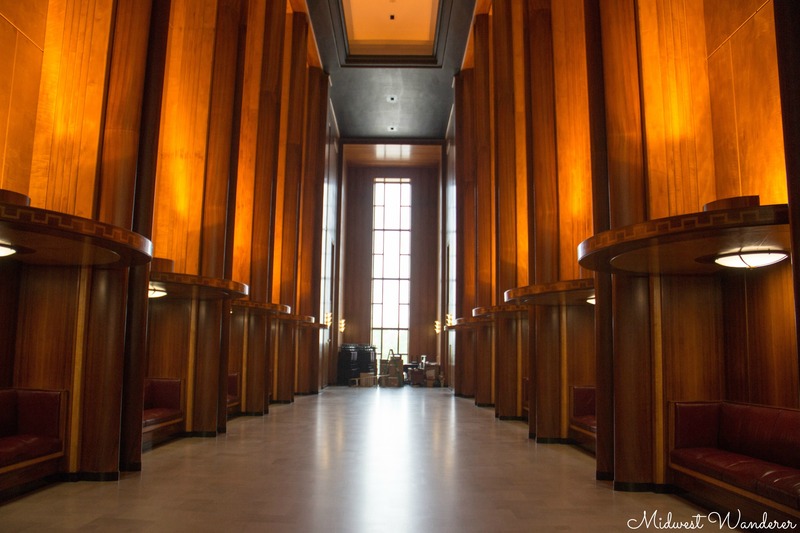 Forty-foot ceilings in the Legislative Hall create quite an echo. Alcoves with drop ceilings provide quiet spaces to talk. 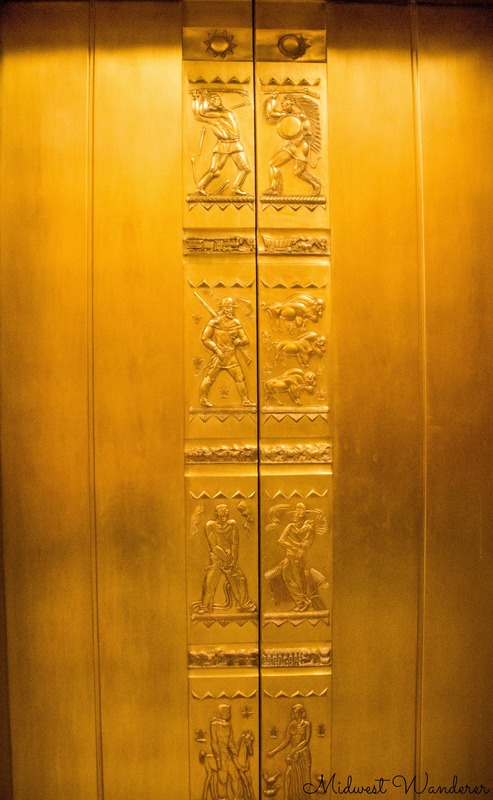 Edgar Miller designed the elevator doors to represent the history and the future of the prairie. The design includes a sun, moon, representation of Indian Wars, agriculture, and industry. The building addition cost $11 million to build in 1980 vs. $2 million to build original building. The Supreme Court is housed in the new addition, which was built with much better acoustics than the original building. 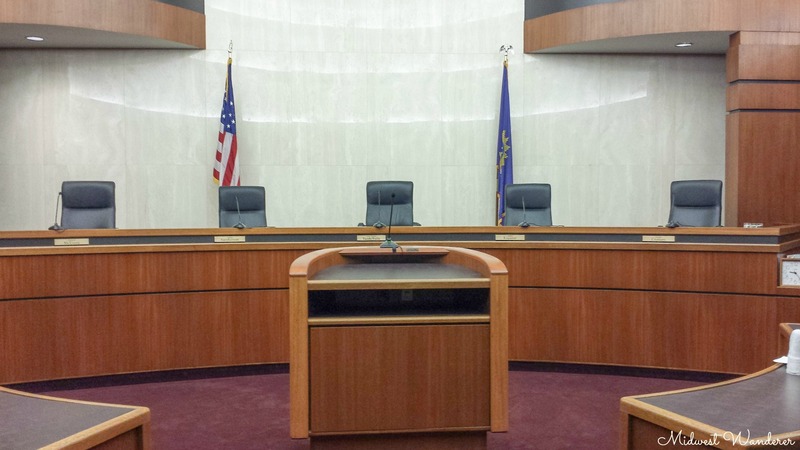 The Supreme Court meets ten months out of the year and hears approximately 300 cases. That’s about 2.5 times what the U.S. Supreme Court hears. Two or three times a year they hear cases in schools so students can experience the process. Our guide assured us this small room, formerly a private entrance to the Secretary of State’s office, isn’t called the Monkey Room for political reasons. Rather, it’s because of the designs in the wood. 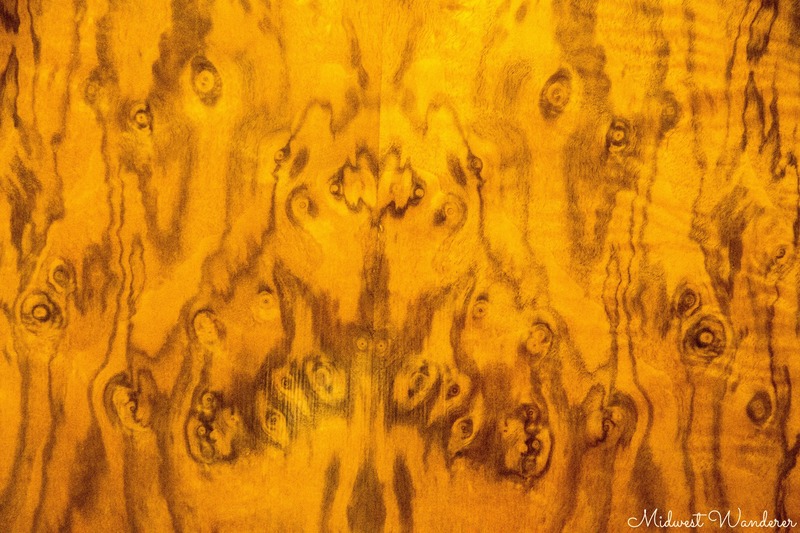 The wood in this room is the very rare yellow California walnut. It was sent to the capitol by error. They couldn’t return the wood, so they used it. The wood has a lot of knots and grain to it, and people often see objects in it, the way you might see objects in cloud formations. Many people see monkeys in the designs. I didn’t see any monkeys, but I could see this wolf-like creature with its paws reaching out toward me. The fire started from fluid on janitorial rags that ignited. The building burned so quickly they opted not to even try to save the building. With only one water tower on the premises, they chose to save the library instead. The building floors are numbered using the international numbering system. The ground floor, which many of us would consider the first floor is called “G.” Then the next floor up is called Floor 1. The observation deck on Floor 18 (which most of us would consider Floor 19) is 240+ feet up. On a clear day you can see 30 to 35 miles in the 360 view. 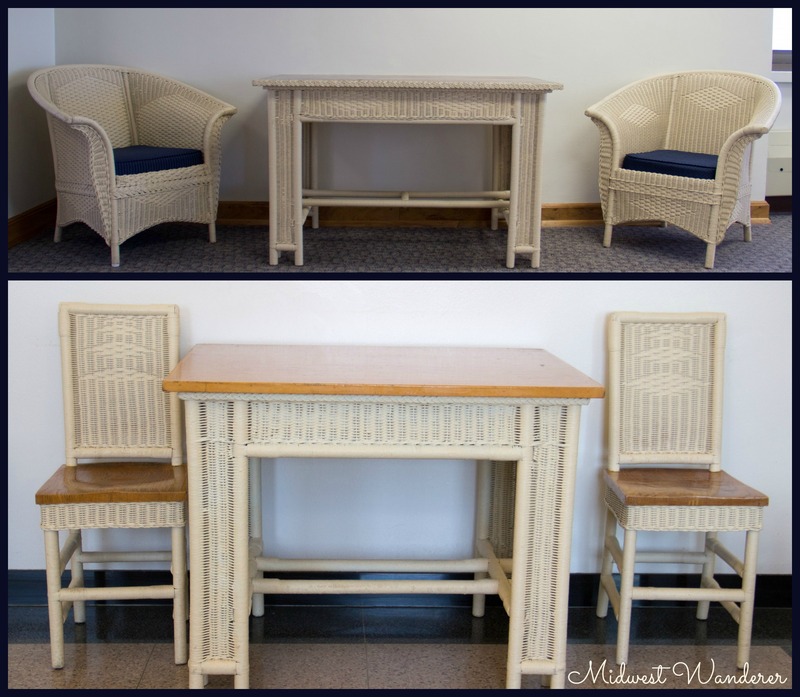 As part of their therapy, patients living in the former Jamestown Mental Hospital made wicker furniture. 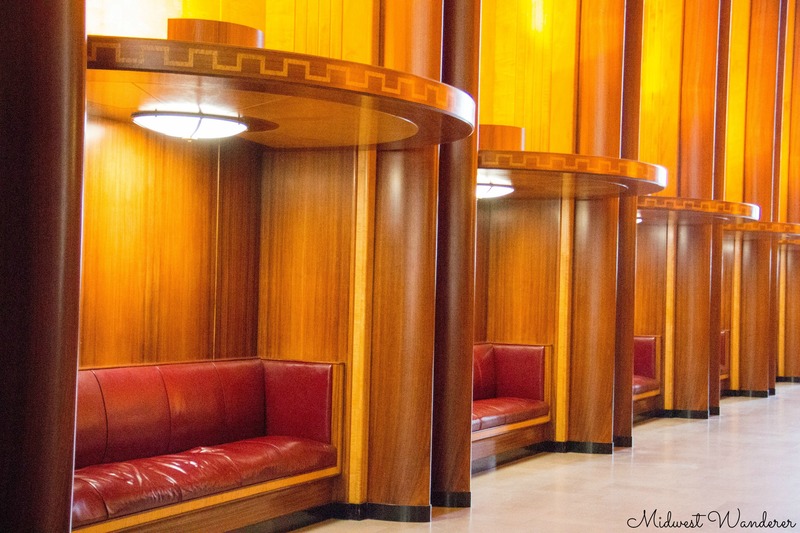 Some of that furniture is located on the observation deck and in the ground floor ladies room. The record for the most people making snow angels simultaneously is 8,962, as listed in the Guinness Book of World Records. That took place on the State Capitol grounds on February 17, 2007. 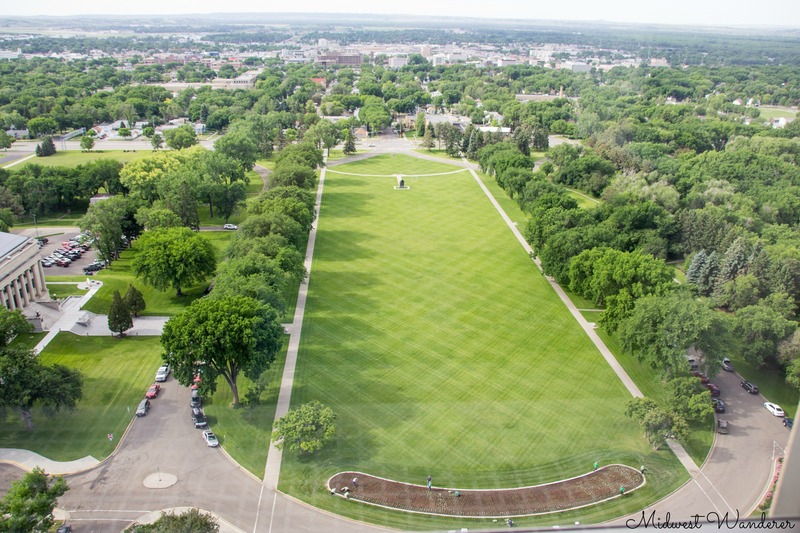 North Dakota capitol grounds where the snow angel record was set in 2007—when the grounds were covered in snow. 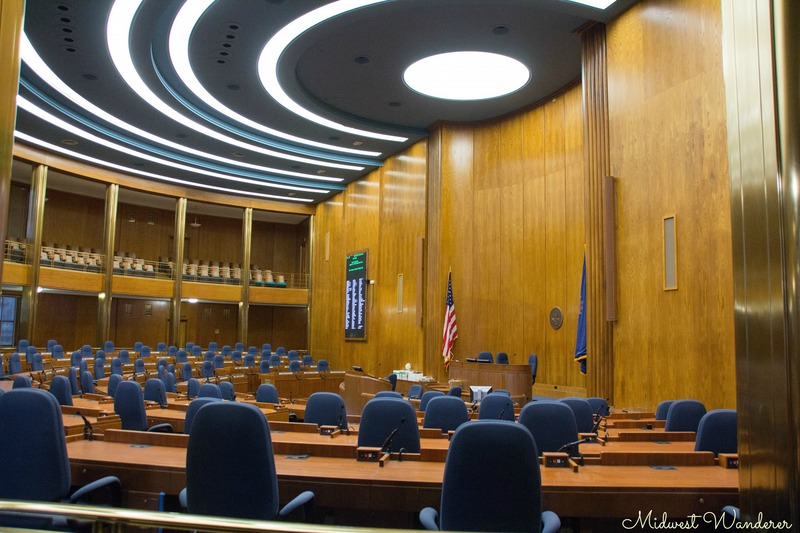 The North Dakota state capitol, located at 600 E Boulevard Avenue in Bismarck, offers free tours to the public. Tour times vary slightly depending on the season. Check the website for times and other details. 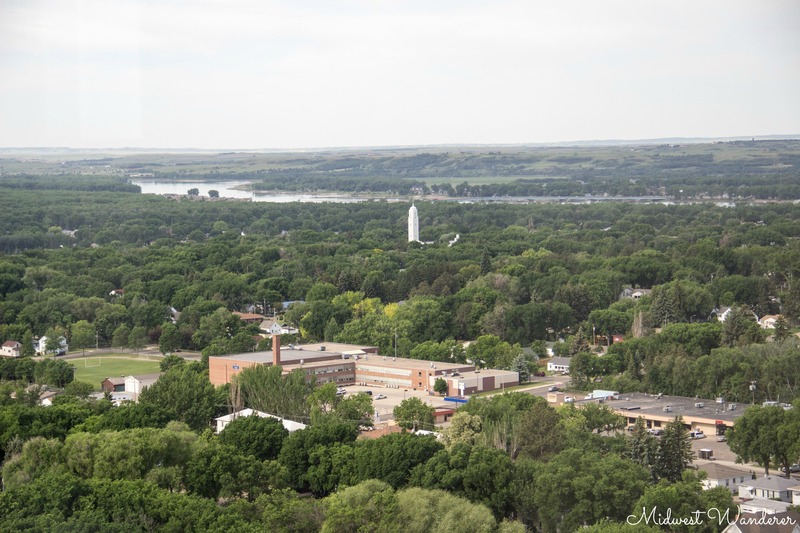 We stayed at the Baymont Inn and Suites in nearby Mandan during our visit to Bismarck. 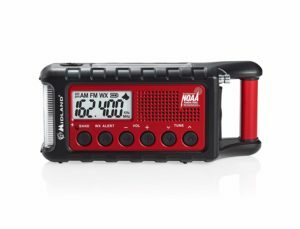 Check rates here. Disclosure: This article contains an affiliate link. If you book a room through the “Check rates here” link above, I will receive a small commission, at no additional cost to you.